Temecula, California Master Chefs’ Institute, LLC, announced today the addition of Brian Beland, Certified Master Chef, as an Associate. Master Chefs’ Institute is an esteemed international organization that is dedicated to preserving the highest standards of culinary excellence. Among its many services, Master Chefs’ Institute conducts comprehensive testing of food, equipment, and beverage products and awards the Master Chefs’ Seal of Excellence only to thosel products that outperform the competition and meet the quality standards of the Master Chefs. Chef Beland is Executive Chef Director of Food and Beverage for Country Club of Detroit, overseeing every aspect of the club’s Food & Beverage Services. Country Club of Detroit, located in Grosse Pointe Farms, Michigan, is a private club of over 800 members and has hosted two United States Amateur Championship golf tournaments. He is also a full-time culinary instructor at Schoolcraft College in Livonia, Michigan. Chef Beland is a graduate of The Culinary Institute of America (CIA) and Michigan State University’s School of Hospitality Business. Chef Beland’s career highlights include the American Culinary Federation Certification Commission and Chair of the CMC/CMPC certification program. He was Vice President of ACF’s Michigan Chefs de Cuisine Chapter in 2011, President for the 2013/14 term, and Chairman of the Board 2015/16. As a member of the 2012 Michigan Culinary Olympic Team, Chef Beland scored an individual gold medal in Category A in Erfurt, Germany. Also in 2011, Chef Beland was recognized as Chef of the Year for MCCA Chapter, won the Central Regional Chef of the Year title in 2012, and went on to score a gold medal at the ACF National Chef of the Year competition. In November, 2013 Chef Beland competed at the inaugural Dubai Hospitality Championships as a member of Team USA scoring a team gold and second place overall. "I am honored and humbled to be invited to join the Master Chefs’ Institute," states Chef Beland. "The Master Chefs’ Institute helps chefs around the world precisely know what to expect from a product in terms of performance, consistency, and quality. To be part of an organization that lets chefs make sound decisions based on recommendations from the world’s culinary elite is a winning scenario for everybody." Chef Ferdinand Metz, CMC, Managing Partner of Master Chefs’ Institute states, "We are very excited to elcome another Certified Master Chef to the Institute. Chef Beland has dedicated most of his life to the pursuit of culinary excellence, beginning in his teens working at his family’s restaurant. His passion, ambition, and talent, sparked at a young age, has resulted in a career full of noteworthy achievements. He consistently demonstrates to both his staff and students the importance of working with integrity and upholding the highest standards. 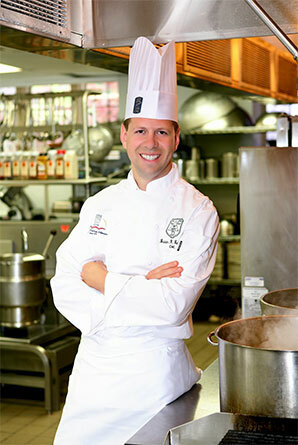 Chef Beland will be a valuable member of the Institute."